Sydney has always been overshadowed by her brother Peyton, both in her family life and at school. He’s the “cool” kid, who always accepts dares he’s been challenged to and is preceded by his reputation. When Peyton gets behind the wheel drunk (after a year of sobriety, no less), the unthinkable happens and he hits a young boy on his bike, paralyzing him from the waist down. Saint Anything explores the impact that this accident has on Sydney and her family. While trying to escape Peyton’s increasingly bad reputation, Sydney transfers high schools and becomes friends with Layla Chatham. Layla immediately takes Sydney under her wings and the two rapidly become friends, bonding over lollipops at the pizza parlor and Layla’s very meticulous French Fry eating habits. Sydney becomes a part of something special when she is brought into the Chatham family’s sphere; Mac and Layla both care deeply about Sydney and Mrs. Chatham offers the advice that Sydney isn’t able to get from her own mother, who is always preoccupied with Peyton-this-or-that. Obviously, not everything is sunshine and rainbows; Sydney has to deal with a creepy family-friend Ames, guilt that just won’t go away over the accident, and a mother who means well but takes her control over Sydney’s life too far. I really don’t know how to find the words to do this book justice. Sarah Dessen has outdone herself with Saint Anything. The exploration of the relationships is part of what makes Saint Anything so special. Sydney’s relationship with Mac isn’t a typical love story; it’s subtle, significant, and special, and grows carefully through shared experiences and friendship. Layla and Mac help Sydney find the anchors she needs to move past what has happened with Peyton. She finds strength, courage, and the ability to be herself and face what it is she needs to face. 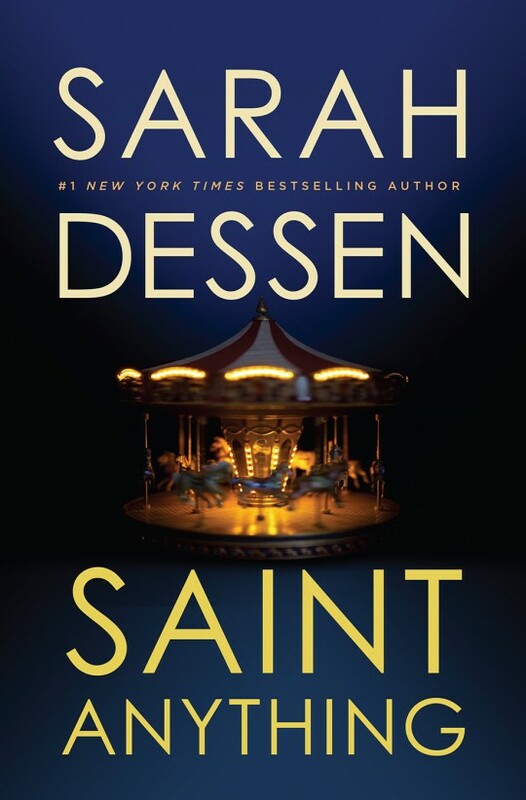 In Saint Anything, Sarah Dessen has woven a world so well and so real it feels like I could run into Sydney or Layla next time I buy French fries or have Mac delivering my pizza. I cringed and felt sickened every time Ames said or did something creepy towards Sydney. I wanted to shake Mrs. Stanford by the shoulders to get her to notice Sydney and snap out of being so protective of Peyton. I was along for the ride (pun not intended!) as Mrs. Chatham’s MS got worse. Dessen explores some dark topics in this book, from drunk driving and beyond, but these are things that teenagers can relate to and are things that need to be talked about. Saint Anything is not a light and fluffy read; it’s one that will make you think and feel. Every time I put it down, I was unable to stop thinking about it. When I finished the book, I had tears in my eyes and couldn’t get over how much the story had touched me. I am a naturally empathetic person but very few books have had as profound an impact on me as Saint Anything did. It is emotionally powerful, full of depth and discovery, yet has enough light to keep it from being depressing or overwhelmingly dark. Saint Anything has made its way onto my list of top 10 favorite YA novels of all time and I think it’s one that everyone, not just young adults, can relate to and be touched by. Saint Anything is now in stores so (please) pick up a copy of this incredible story! Thank you to Viking Juvenile and Penguin Teen for proving an ARC of Saint Anything. While I received an advanced copy for free, I was in no way compensated for this review. All thoughts, reactions, and emotions are my own! Next ArticleTV Review: The Flash (1x21) "Grodd Lives"